Time to dust off the old gear. After a long few months behind the scenes, Nitidus are coming back to rock your world very soon. We’re organising festival appearances in the summer. We’ll let you know more about that soon. Speaking of festivals, you can still vote for Nitidus to play at the Grazzhopper Festival 08. We’re locking in some rock shows and more ways for you to access our music. V-Raw featured us on their website for a while, thanks V-Raw. Patrick has been a busy dad. Buzz Magazine printed an interview with Nitidus, thanks Monique. 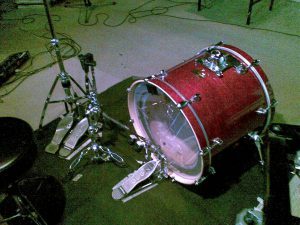 A bunch of new studio tracks have been added to the Myspace page for your listening pleasure. The Musicland show earlier this year was broadcast on Channel 31’s Asylum TV. As well as that, we’ve been spending some time checking out the other talented bands doing the hard yards out on the Melbourne live music scene. Shout outs to Gretchen Lewis, Dusted Orange, Exile, Crimson Face, Kids In Cults, Against The Grain, Daddy’s Little Girl, Siren’s Gate and Lucy’s Crown. Watch this space, more of the good stuff coming at ya! Hey rockers, just droppin’ a line to say thanks for all the good times in 2007. It’s been a massive year for Nitidus and one hell of a roller coaster ride, but we made it through alive and we hope you all enjoyed the fireworks! Read on for a recap of this year’s highlights. Winning the LA Music Award for Hard Rock Artist of the Year was like a sign from the gods of rock beckoning us to Hollywood. The band went into overdrive writing, rehearsing, selling wine and paying off credit cards ready for a blow out LA tour mid year. While our minds were focused on making the LA tour happen this year, we still kept the gig calendar filled up with dates around Victoria sharing stages with Taxi Ride, Justin Murphy and others. The 21 Alibis promotional tour of west coast USA stands out as one of the greatest moments in the turbulent history of Nitidus. 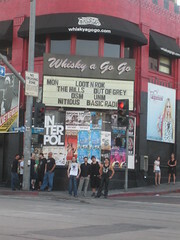 All of us crammed into an RV for a 3 week long endurance test that pushed our sanity to the brink… but still got us around California and Nevada to rock some world famous venues: The Whiskey A-Go-Go, The Roxy, The Key Club, The Gig Hollywood and many more. 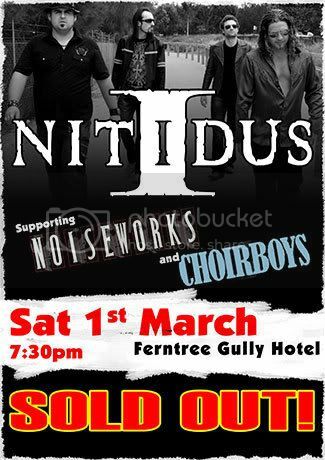 The tour was a big success and Nitidus definitely left an impression and kicked some major doors wide open. Leaving the States afer the tour was bitter sweet, as we left behind some great times, some great shows and some new fans. 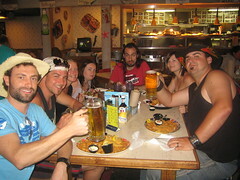 Hope to see you all again real soon! 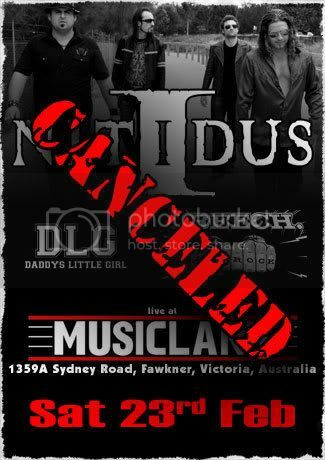 Back in Australia, there was no slowing down for Nitidus. In the last few months we signed our fates over to the good hands at Fa’Sho Management, recorded some hot new tracks that you can now hear on Myspace and caused all shades of chaos on the red carpet of this year’s ARIA Awards. 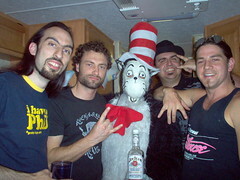 Plus we rocked some massive gigs with some of Australia’s finest, including Diesel and Airbourne. 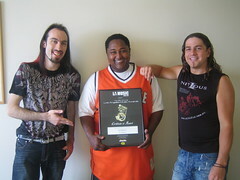 With more big shows coming and a whole lot more than you can imagine going on behind the scenes, 2008 is shaping up to be another wild ride on the Nitidus pony. So that’s it for another year. Thanks for coming to the show, hope you all had a great Xmas and we’ll see you in the new year for more mayhem.